Boreholes drilled perpendicular to a set of geological features will readily intersect these features. In strong contrast, those wells drilled parallel or near parallel to a set of geological features will rarely intersect such features. This results in borehole sampling bias, with feature recognition a function of hole orientation rather than the spatial organisation of such features. This will result in an under determination of features (e.g. 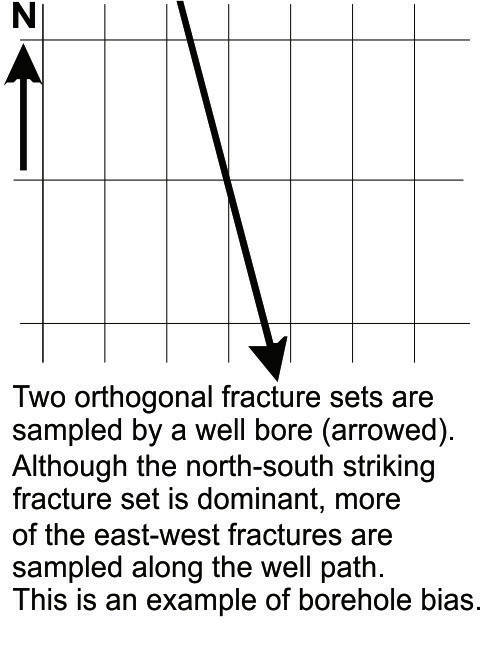 fractures), and other surfaces, that strike parallel or near parallel with the borehole azimuth. This sampling bias can also include bedding planes, in particular with steeply inclined or horizontal wells. Borehole bias can be severe with many important surfaces not incorporated into interpretations. A partial correction (the Terzaghi correction) for this borehole bias can be made which helps limit its negative effect. Bias also applies to convex surfaces such as sandstone-shale channel margins and contacts, and cross-bedding. In particular, horizontal wells drilled through such successions will preferentially cut the oversteep parts of sandstone-shale contacts and cross-bedding and this results in an overestimate of mean contact dip. It is not because the dips are steep by deformation (e.g. faulting), they are steep by default of a sampling bias.